Supremely situated right on Koufonisi Beach with its emerald colored crystal clear waters, Myrto Hotel offers spacious sea view accommodation, in shiny clean rooms and suites with balcony and a majestic, unobstructed sea view of the Aegean. The standard and superior rooms & suites, cover a wide range of all needs individually for every guest, such as couples or families and travellers who search for an affordable accommodation in Koufonisi, as well as guests who search for discreet luxury hotels in Koufonisi. The tranquility and natural beauty of the island ensure for lifetime, memorable holidays in Greece. The bright Cycladian aesthetics of the hotel’s interior and exteriors, combined with the simplistic design lines and the naturalness of the marble stone, create an environment to experience a genuine Cycladian accommodation in Koufonisia. Conveniently located at the entrance of the village (Chora), Myrto Sea View Hotel, offers easy walking access to all shops and points of interest, such as souvenir shops, mini markets, restaurants, café-bars and public services. 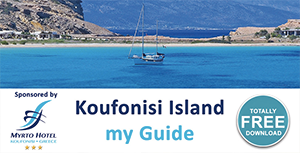 Everything you may need is just a few steps away walking distance from Myrto Sea View Hotel in Koufonisi. Furthermore, Myrto Hotel is next to all means of transports, taking you to the crystal clear, exotic beaches of the island. Clean and comfortable accommodation in spacious rooms & suites, with a daily fresh buffet breakfast and cleaning service, is provided for guests’ convenience and joy during their unique summer holidays in Koufonisia. The affordable rates in the hotel’s elegant rooms tempt all Koufonisi Island visitors who wish to experience authentic Greek hospitality in standard or sea view accommodation. The minimal chic design of the rooms and hotel’s interiors with the soothing colours, ensures a relaxing atmosphere for all guests and a great choice, among beach hotels and sea view hotels in Koufonisi Island, Greece.